Crude Oil prices are going up! Mexican Crude Oil price beat barrier of the US$60 per barrel. For the first time since Black October the crude oil prices have returned to a continuous escalade. The price reported US$61.17 almost doubles the prices shown in December 2008. 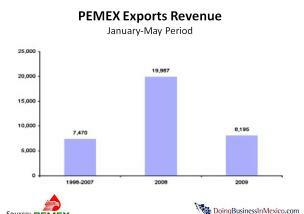 PEMEX performance in the first five months of 2009. The daily production was 2.650 million barrels; slightly below the company´s year projection of 2.7 million barrels per day. The average export price in May was US$55.71 per barrel, the best monthly price since Black October, and close to the government 2009 budget estimation of US$70. The exports revenue in the period of January-May 2009 totaled US$8.195 million, a 59% lower than the same period of 2008. A similar trend was followed by the major oil companies in the world. Just as a comparison, Exxon-Mobil, BP, Shell, Petrobras and Total reported decreases from 32% to 49% in the same period. 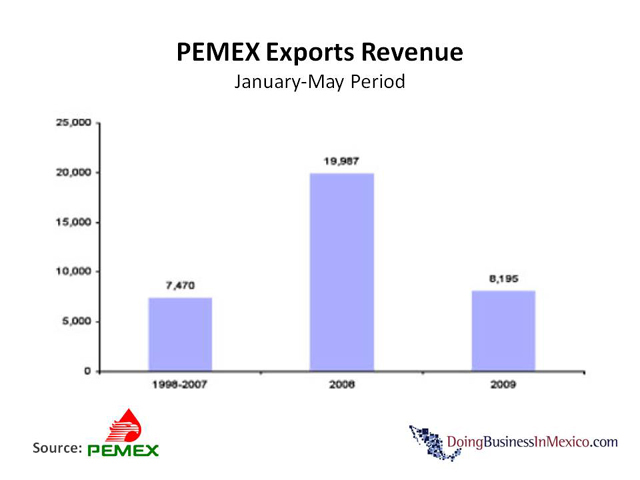 Still, PEMEX exports revenue was 9.7 higher than the average experienced for the Jan-May period in the years 1998 to 2007. It is important to mention that year 2008 was more than exceptional, with record prices and high production levels.